What can BusTracks do for your school district? The numbers show it all. School District 1: Reduced Bus Runs from 67 to 57, reduced over all mileage 100,000 miles and reduced average ride time from 85 to 64 minutes. This saved over $300,000. 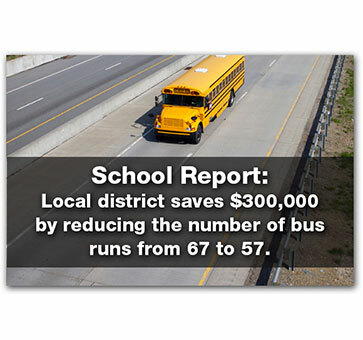 School District 2: Eliminated 4 Bus Runs and saved $135,000. School District 3: Reduced Bus Runs from 30 to 25, reducing costs over $155,000. BusTracks is more than just software. It is a complete transportation management program including personal service* and no hidden extra charges. Find out how we can help you with Route Analysis. Call us at 1-800-303-2921. *Personal service that has earned a 97% satisfaction rating.